Chimpanzee Tea Party: Curry Leaves? Curry leaves have nothing to do with curry powder. Nothing at all. Curry powder is ground spices such as cinnamon, turmeric and coriander. It may or may not include curry leaves. Though they look similar, unlike bay leaves, curry leaves are edible. 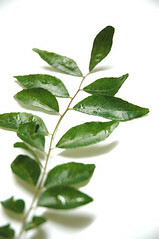 Traditionally, curry leaves are used in multiple ways. First remove the leaves from the stem. You can add the leaves at the beginning of a recipe, sizzling them in hot oil and then adding ingredients such as vegetables, cooked basmati rice or poultry. As the final seasoning to a dish, the leaves are sizzled in hot oil along with other spices such as black mustard seeds, and the hot seasoned oil is poured over a prepared dish — for example, a bowl of plain yogurt or stewed lentils. I definitely have never seen or heard of these, but I am somewhat notable in being the one person in the world who doesn't totally crush on Indian food. I can't imagine we'd have a lot of luck finding the fresh leaves in Boston, but there are a fair number of Asian grocery stores in the area that have all sorts of things that I am oblivious to and probably wouldn't comprehend even if I was made aware of them. So who knows? Click through the link for a more full description and some recipes, including the intriguing curry leaf mojito.